The scenary we see through the gate of “Santa Maria”(the main entrance of the square) leaves you breathless. This is the most requested place by tourists and it’s easy to understand why. 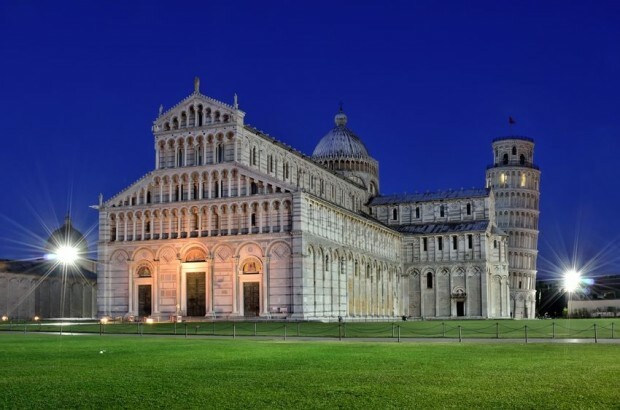 Do not miss a guided tour of Pisa, the first monument which was built here was the Cathedral, a jewel in our “Pisan Romanesque” style dedicated to Saint Mary of the Assumption. 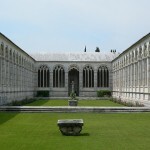 Inside we find masterpieces such as the gothic pulpit by Giovanni Pisano or the Galileo Galilei lamp. The Baptistery, with its rare circular shape, deserves a visit even just for hearing the sound of the acoustic reflection that every 30 minutes the guardian will make you hear. With your tourist guide in Pisa you’ll have a memorable experience visiting the monumental cemetery full of very important pieces of fine art like roman sarcophagi, wall covered frescoes of the 14th and 15th century. Into the Sinopie museum, located in the medieval hospital of Santa Chiara, we find a great collection of sketches of the frescoes still in the cemetery. The Museum of the “Opera Del Duomo”, which is located in a beautiful 13th century building, hosts an art collection of manufacts from the various building of the square. The leaning tower…well, it speaks for itself… For those who make their way the top thrills and amusement is guaranteed. We’ll help you with the booking of the tickets for the leaning tower. The length of the guided tour of Pisa depends on the monuments you are interested in, it goes approximately 45 minutes up to 3 hours. We can link this tour with others: ask your guide for advices.